The ecological crisis and the related consequences for societies and nature calls for a change in individual consumption behavior. Empirical evidence has shown correlations between mindfulness and ecological behavior, pointing out the potential of mindfulness to support changes in behavior toward greater sustainability. Due to its ecological impact, the field of individual food consumption constitutes a central domain in environmentally relevant behavior. However, what is presently lacking is a differentiated view on various dimensions of mindfulness and their relation to sustainable food consumption and other important predictors of ecological behavior. The present study tests hypothesized relationships between five dimensions of mindfulness, the construction of meaning in life, sustainability-related meaning, personal ecological norm, and sustainable food consumption. A cross-sectional study was conducted, which included participants with and without the experience of meditation (N = 310). Structural equation modeling shows that only the mindfulness dimension acting with awareness has a direct and weak positive relation to sustainable food consumption (β = .11, p = .04) when construction of meaning, sustainability-related contents of meaning, and personal norms are included. Further, it was seen that observing (β = .45, p < .001) and describing (β = .21, p = .004) are positively related to construction of meaning, while non-judging against expectations has a negative relationship to construction of meaning (β = −.21, p = .004). Also, a serial mediation, with construction of meaning, sustainability-related meaning, and personal norm as mediators between observing and sustainable food consumption, was tested and confirmed. The results demonstrate the value of a differentiated view on the aspects of mindfulness with regard to sustainable food consumption. The online version of this article ( https://doi.org/10.1007/s12671-018-0986-0) contains supplementary material, which is available to authorized users. MH designed the study, assisted with the data analyses, and collaborated in writing and editing of the paper during the whole process. NR collaborated with the design and execution of the study, collected data, analyzed data, and collaborated in writing the paper. All procedures performed in studies involving human participants were in accordance with the ethical standards of the institutional research committee of the Dortmund University of Applied Sciences and Arts and with the 1964 Helsinki declaration and its later amendments or comparable ethical standards. BMELV (2008). Bericht des BMELV für einen aktiven Klimaschutz der Agrar-, Forst- und Ernährungswirtschaft zur Anpassung der Agrar- und Forstwirtschaft an den Klimawandel. Bundesministerium für Ernährung, Landwirtschaft und Verbraucherschutz. [Report of the BMELV for an active climate protection of the agriculture and forestry to the climate change. Federal Ministry of Food, Agriculture and Consumer Protection]. Retrieved from: http://www.bmel.de/cae/servlet/contentblob/383152/publicationFile/22425/Klimaschutzbericht2008.pdf. Panno, A., Giacomantonio, M., Carrus, G., Maricchiolo, F., Pirchio, S., & Mannetti, L. (2018). 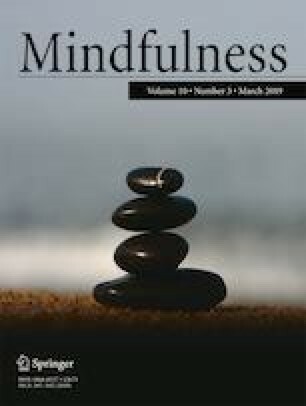 Mindfulness, pro-environmental behavior, and belief in climate change: the mediating role of social dominance. Environment and Behavior. https://doi.org/10.1177/0013916517718887.